Bethel Dental has invested in a new way of looking into your mouth – a procedure that's fast, comfortable, and incredibly precise. Using digital X-rays, we can clearly identify all external and internal anatomical structures and accurately diagnose your dental problems. Even more amazing is that we can immediately translate that information into a large, clear, and accurate image. This image is projected onto a monitor that you and our dentists can study together while you sit comfortably. You will not have to leave your chair. 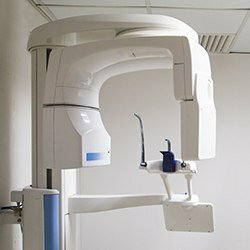 Digital X-ray technology improves and simplifies the way we care for your teeth, resulting in better dental evaluations and treatment decisions. As you are the most important member of your dental team, you need to understand the condition of your mouth, as well as our recommendations for treatment. Digital X-rays help us help you. Some of the many advantages of digital X-rays over film X-rays include the immediate image availability. It is easy to reproduce digital X-rays. It also gives us the ability to apply special image processing techniques that enhance the clarity of the image. The digital images store easily and efficiently. For insurance purposes, referrals, or patient education, digital X-rays can be easily, inexpensively, and accurately reproduced as many times as needed. 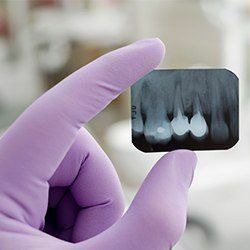 Traditionally, dentists used X-rays to see what the naked eye could not; they were developed in a darkroom with hazardous chemicals and then viewed on a special light board. The developed X-rays had to be stored, which required large filing systems. By far, the worst part of traditional X-rays was the radiation exposure to patients. Digital X-rays have completely transformed this process. Digital X-rays offer a huge advantage in early detection and preventive services. 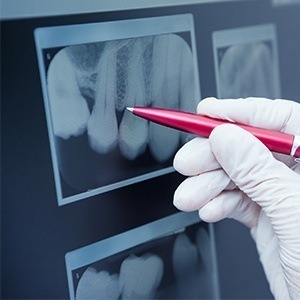 Advanced image manipulation and analysis, for example, allows us to detect early stages of gum disease through recognition of bone level changes, or by evaluating the results against a previous treatment. Best of all, they are safer for our patients. A panoramic image is an X-ray that depicts a panoramic view of your mouth – from one side to the other. This image can help the dentist understand the relationship between your teeth, jaws, and occlusion (bite, or how your top and bottom teeth fit together). This image is saved as part of your dental records. The beauty of this is that you do not have the deal with the inconvenience of leaving our office, driving in the hot sun, and having an X-ray taken elsewhere. Everything is available within our practice! This new technology is essentially “filmless” X-ray image capture. 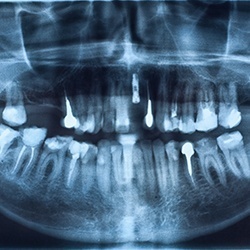 In place of X-ray film, a digital image capture device is used to record the X-ray image and make it available as a digital file that can be presented for interpretation and saved as part of your dental record. You do not have to leave your chair – this digital technology is right by your chairside in each of our treatment rooms. If you would like to learn more about the comprehensive dental services offered at Bethel Dental in Accra, Ghana, contact us today. We invite you to experience the difference that the latest technology will make in your dental care. We serve patients from all over Ghana, and people come to us from neighboring countries like Nigeria and Liberia as well.